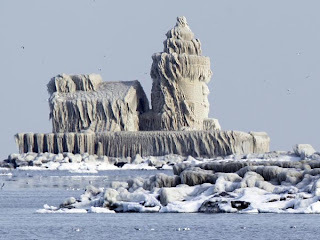 It's not a wedding cake, an ice sculpture, an ice hotel or Snow Miser's palace—just a lighthouse at the entrance to Cleveland Harbor in Ohio, as seen enrobed in ice on December 16. Spray from Lake Erie and below-freezing temperatures turned Cleveland's West Pierhead Lighthouse into a Popsicle last week, leaving the Coast Guard to worry that any stubborn skippers braving the lake this time of year would miss the shoreline. The light's lens, as well as the rest of the building, is completely iced over—and will be for months. Mariners have been issued warnings to exercise extra caution around the harbor entrance, though most boat traffic has already stopped for the season, said Petty Officer 3rd Class George Degener, who serves with the U.S. Coast Guard's Cleveland-based Ninth Division. On the bright side: There's no lighthouse keeper shivering inside the icy tower. The facility has been automated for decades. Here is a part of the program from the CityWalk@Akard Christmas party last week. Thanks to Rachel Lamb, our intern from Perkins School of Theology at SMU, for organizing the ongoing dance classes for these special children who live in the building. So, I innocently appear at our local, neighborhood Post Office a couple of weeks ago. My mission, super simple: I needed to purchase Christmas stamps for cards we planned to mail--you know, the kind that shamelessly picture and brag about your grandchildren! After waiting my turn in line, I approach the postal clerk and declare my need for 100 stamps. "Sorry sir, we don't have any stamps today," the woman behind the counter declared with a touch of sadness in her voice. I get that part! "Did I hear you correctly? You are a post office and you have no postage stamps?" I asked incredulously. "Yes sir, I'm afraid so," she replied. "We hope to have some by Tuesday." "Hope" to have stamps at a post office? Hmmm. Something about "I'll gladly repay you Tuesday for a hamburger today" drifts into my mind out of my cartoon-shaped mind/soul. So, being a lifelong supporter of the U. S. Postal Service and of the tireless men and women who deliver my mail on a daily basis, I accept the disappointing news and retreat to my car, vowing to return on Tuesday. I don't make it back until Thursday. Again, I present myself with my simple request when my turn comes: "Yes, I need 100 Christmas stamps," I declare with the confidence of a man eager to show off his grandchildren to a few dozen friends. "Sir, I'm sorry, but we have no stamps today. We expect a delivery by Friday," the postal clerk wearily explained. I bet she was tired! Can you image the thought of a Post Office without stamps! By now I am beside myself. I didn't take out my frustration on the depressed clerk, but I did call the local Postmaster's office. I got connected, after a rather long wait, to a gentleman who doubtless had received calls from frustrated patrons such as me possibly all day long! "You know, sir, the stamps have to come from Kansas City," he explained. Is this really my problem? I started to explain what UPS could do for the USPS, but thought cynicism might send the gent over the edge, so I resisted the temptation. "I think I have discovered the basic problem with the USPS," I told the rather short-tempered man on the other end of the line. "You can't even address the basics of your core business--selling stamps!" "Selling stamps is not our 'core business' any longer," he explained. "What with on-line payments, etc., we just aren't in the same business as before." Still, a P. O. with no stamps? This isn't sounding good for my Christmas cards, and the photos of my 4 adorable grandchildren are so great this year! This entire experience has set me thinking again about life in poorer neighborhoods that marginalized folks call "home." Frankly, just about everything is like a P. O. with no stamps! No grocery stores, and the corner convenience stores don't have what a person needs and what is there is overpriced and unhealthy. Little code enforcement, especially on slum landlords. Try to bring a legal case against an unscrupulous landlord and see how far you get. Streets surely in cahoots with front-end shops given the number and the depth of the potholes. Schools in disrepair both physically and academically. Safety and crime prevention statistics downright depressing. I think its time we expected more and better. I know one thing, I never wanted for postage when I lived in Richardson! The notion of solidarity in authentic community doesn't come naturally to us. The spirit of "we're all in this together" appears lost to our consumer-driven, "every man for himself" culture. Most revolutionary leadership on the positive side of history's rolling ledger recognizes the importance/necessity of this understanding of our human interdependence. Again, the experience and counsel of Dietrich Bonhoeffer provides challenging guidance in shaping a renewed understanding of the essential nature of standing for and with others, even when no immediate benefit appears obvious for me and my interests. The Nuremberg Laws represented what has been called a second, "more ordered" phase of Jewish persecution. Jews. who were once legal citizens of Germany, were becoming subject of the Third Reich. Their citizenship was banishing, legally, in the center of Europe, in the twentieth century. Bonhoeffer had known of this pending legislation through Dohnanyi (his brother-in-law), who tried to thwart it, or blunt it, in vain. Bonhoeffer saw the enactment of these laws as an opportunity for the Confessing Church to speak out clearly, in a way they had not yet been able to do. The Nazis had drawn a line in the sand and everyone could see it. But the Confessing Church was again slow to act. It was guilty of the typically Lutheran error of confining itself to the narrow sphere of how church and state were related. When the state is trying to encroach upon the church, this is a proper sphere of concern. 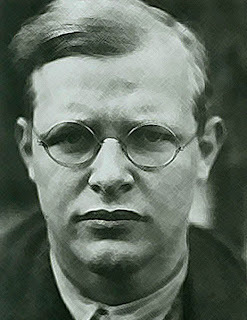 But for Bonhoeffer, the idea of limiting the church's actions to this sphere alone was absurd. The church had been instituted by God to exist for the whole world. It was to speak into the world and to be a voice in the world, so it had an obligation to speak out against things that did not affect it directly. Bonhoeffer believed it was the role of the church to speak for those who could not speak. To outlaw slavery inside the church was right, but to allow it to exist outside the church would be evil. So it was with this persecution of the Jews by the Nazi state. Boldly speaking out for those who were being persecuted would show the Confessing Church to be the church, because just as Bonhoeffer had written that Jesus Christ was the "man for others," so the church was his body on this earth, a community in which Christ was present--a community that existed "for others." To serve others outside the church, to love them as one loved oneself, and to do unto them as one would have others do unto oneself, these were the clear commands of Christ. Around that time, Bonhoeffer made his famous declaration: "Only he who crises out for the Jews may sing Gregorian chants." As far as he was concerned, to dare to sing to God when his chosen people were being beaten and murdered meant that one must also speak out against their suffering. If one was unwilling to do this, God was not interested in one's worship. Mrs. Edelman's Child Watch Column also appears each week on The Huffington Post and Change.org. I "lifted" the following story from Edelman's column. She reports on a very special Christmas Eve sermon delivered at the Riverside Church in New Yorik City by her friend William Sloan Coffin, Jr. Her Christmas story provides all the direction we need to craft a better community as we begin our first steps toward next Christmas, don't you think?
. . . it was Christmas Eve and the pews at New York City’s Riverside Church were packed. The Christmas pageant was underway and had come to the point at which the innkeeper was to turn away Mary and Joseph with the resounding line, “There’s no room at the inn!” The innkeeper was played by Tim, an earnest youth of the congregation who had Down Syndrome. Only one line to remember: “There’s no room at the inn!” He had practiced it again and again with his parents and the pageant director and seemed to have mastered it. So Tim stood at the altar, bathrobe costume firmly belted over his broad stomach, as Mary and Joseph made their way down the center aisle. They approached him, said their lines as rehearsed, and waited for his reply. Tim’s parents, the pageant director, and the whole congregation almost leaned forward as if willing him to remember his line. “There’s no room at the inn!” Tim boomed out, just as rehearsed. But then, as Mary and Joseph turned on cue to travel further, Tim suddenly yelled “Wait!” They turned back, startled, and looked at him in surprise. “You can stay at my house!” he called. Well, Tim had so effectively preached the Christmas Eve message at Riverside Church that Bill Coffin strode to the pulpit, said “Amen,” and sat down. It was the best sermon he never preached. When will we individually and collectively as congregations, as communities, and as a nation resolve to stop saying to our children, “There’s no room at the inn”? When will we, like Tim, start saying, “You can stay at my house”? As the recession’s dangerous effects linger, when will we say to poor, hungry, and homeless children, “Wait! We’ll make a place for you at America’s table”? How long until we say to children whose parents are working hard every day trying to keep food on the table and a roof over their heads, “We will help you escape poverty”? “We’ll catch you in our safety net until your family is able to provide for you again”? Food for thought and reflection this Christmas season. It is a good thing to observe Christmas day. The mere marking of times and seasons, when men agree to stop work and make merry together, is a wise and wholesome custom. It helps one to feel the supremacy of the common life over the individual life. It reminds a man to set his own little watch, now and then, by the great clock of humanity which runs on sun time. But there is a better thing than the observance of Christmas day, and that is, keeping Christmas. Are you willing to forget what you have done for other people, and to remember what other people have done for you; to ignore what the world owes you, and to think what you owe the world; to put your rights in the background, and your duties in the middle distance, and your chances to do a little more than your duty in the foreground; to see that your fellow-men are just as real as you are, and try to look behind their faces to their hearts, hungry for joy; to own that probably the only good reason for your existence is not what you are going to get out of life, but what you are going to give to life; to close your book of complaints against the management of the universe, and look around you for a place where you can sow a few seeds of happiness--are you willing to do these things even for a day? Are you willing to stoop down and consider the needs and the desires of little children; to remember the weakness and loneliness of people who are growing old; to stop asking how much your friends love you, and ask yourself whether you love them enough; to bear in mind the things that other people have to bear on their hearts; to try to understand what those who live in the same house with you really want, without waiting for them to tell you; to trim your lamp so that it will give more light and less smoke, and to carry it in front so that your shadow will fall behind you; to make a grave for your ugly thoughts, and a garden for your kindly feelings, with the gate open--are you willing to do these things even for a day? Are you willing to believe that love is the strongest thing in the world--stronger than hate, stronger than evil, stronger than death--and that the blessed life which began in Bethlehem nineteen hundred years ago is the image and brightness of the Eternal Love? Reflecting on the Christmas story seems a natural enterprise this time of the year, right? Well, I've been doing that this week. One of the really human parts of the story relates to housing or, better, lodging. Joseph attempts in vain to secure decent lodging for his young wife on the very night of her delivery. While I can't relate to exactly that circumstance, I can relate to failed attempts at securing timely lodging in a decent location on road trips. Anyone else with "horror stories" about roadside inns? I get what must have been a combination of frustration, anxiety and fatigue, mixed with a little fear and apprehension on the part of both Joseph and Mary. 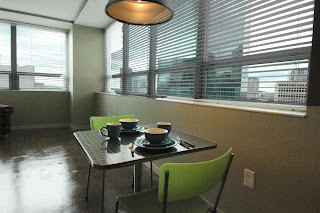 As I pondered the young couple's dilemma, along with the overall circumstance of their compromised reputations related to the child Mary carried, my mind jumped to our housing endeavors aimed to bring homeless persons inside a home, a longer term inn with room to spare on a permanent basis, at least for those who secure one of the 300+ units available. Having no place to live, to stay, to call home is a tough deal shared by far too many men, women and children in Dallas, and across the nation. The CityWalk Christmas party was incredible. Last night wasn’t just a grouping of people in a room who all happen to live in the same building. It was a family. The sense of community was incredible—our neighbors really know each other. And they really know us. There was so much light and so much love in that room. I know that this building was a seemingly endless series of frustrations and obstacles, and there are of course still some things that need to be ironed out. But please just know that it was all worth it. Of course, the story of Joseph and Mary involves a lot more than finding a place to stay. But Jesus entered our world from the stable Joseph managed to secure for that special night. I find it easy to believe and to observe that Jesus continues to enter our world through and in the context of the housing secured for the very poor in developments like CityWalk@ Akard. CitySquare receives funding from the City of Dallas to provide rental and utility assistance to families in danger of losing their housing and "falling off" into homelessness. The funds come as part of the Homeless Prevention and Rapid Re-Housing Program (HPRP). Led by CitySquare team member, Michelle Kopel, this initiative will allow us to provide housing assistance and financial planning of almost $1 million by the time this round of funding ends. We literally are preventing homelessness through this effort. And, the demand is very high. Recently, I learned that candidates for the assistance and the emotional/spiritual care (a really important aspect of the effort) begin lining up as early as 3 a.m. in order to be sure of enrolling in the program! We screen the first 10 people usually on Wednesday and Friday. . . . This is done on a first come, first serve basis. Our voice mail does say this, and we do try to answer all calls. This can be a challenge. I receive about 100 to125 per day!! In order to qualify, the zip code must begin with 752, a late notice, eviction or disconnect must be seen @ time of screening. Also all persons in household must be documented citizens. . . . Lastly we can only assist with people who are leasing not buying. The need is very real in the heart of our city. Yesterday morning my friend of the past 15 years or so, Rockland ("Rock") Richards passed away. He battled heart disease, obesity and the effects of a mighty rough and dangerous life in his early days. When he found himself at CitySquare (back then Central Dallas Ministries), he stuck with us until his untimely departure yesterday. I will miss him. The Central Dallas Church and CitySquare are seeking the funds necessary to provide a funeral and burial for our friend. He was a very poor man materially. But what wealth of heart and soul he possessed. Almost three years ago to the day, I posted what follows about my good friend and partner in community building. I post it again today in his memory and with a hole somewhere inside as I think about not being able to talk to him again, at least for a while. As you'll read, he didn't let me get away with much, especially when it came to taking time for the truly important. I don't think I learned that lesson as well as he would have liked, and I know I haven't mastered it as well as he. I've known Rock for well over a decade. His life story is amazing, hilarious and, at points, frightening. Rock is a reformed drug dealer, thanks to his focus on Jesus and family. Back in the day, Rock was earning between $50,000 and $75,000 a month selling crack and other illegal substances. He drove great cars, wore great clothes and moved among the big shots inside the Dallas drug scene. He knew lots of rich, white college kids. The brother has been shot several times. He can lift his shirt and show you his scars. One evening he found himself trapped in a Cadillac and caught in a crossfire resulting from a drug deal gone bad. It is a miracle he got out alive. The story is scary beyond belief, but hearing him tell it is so funny. Then, he got grand kids. Completely ruined his old life. He told me that when these babies came along, he knew he had to change his ways. And, he did. These days Rock is an active member of the Central Dallas Church. Rock's health is not good. A couple of weeks ago, he was taken to the hospital in critical condition. He was experiencing life-threatening complications resulting from a medication he was taking for his heart condition. He spent several days in ICU. I made a real bad mistake. I didn't go visit him while he was in such bad shape. I had my reasons--most relating to my dad's condition--but, none really justify my failure. When Rock got out, he called me. "Larry, how's your dad?" he asked when I answered the phone. I told him and offered my lame excuses for not coming to see him. "You should have come by, Larry," Rock said. "I love you, Larry. You need to remember that! Stop and smell the roses, man. Check in on a brother when you can," he concluded. I called him yesterday to tell him about my dad's passing. He and dad were friends too. I'll work harder at staying in touch. "In a world where success is the measure and justification of all things the figure of Him who was sentenced and crucified remains a stranger and is at best the object of pity. The world will allow itself to be subdued only by success. It is not ideas or opinions which decide, but deeds. Success alone justified wrongs done. . . .With a frankness and off-handedness which no other earthly power could permit itself, history appeals on its own cause to the dictum that the end justifies the means. . . . The figure of the Crucified invalidates all thought which takes success for its standard." God was interested not in success, but in obedience. If one obeyed God and was willing to suffer defeat and whatever else came one's way, God would show a kind of success that the world couldn't imagine. But this was the narrow path, and few would take it (page 363). We're not short on moving, important, wonderful people stories around here. A bit of background on just one story. We make a habit of attempting to employee the people who come to us seeking assistance with various challenges, almost all associated with poverty. Last year we hired a woman who, when she came to us, had been homeless for several months. She was alone. She had been employed as a reporter for a local trade publication and had been laid off in the financial downturn. Her health was not the best. She was emotionally spent, basically at the end of her rope. She did have the good fortune to work into a sleeping cubicle at The Bridge, Dallas' homeless assistance center. After meeting her, she began to volunteer and eventually we hired her. She has found her place among us and is a very productive member of our team. At our annual Christmas party last week she approached me with a smile on her face and tears in her eyes. "Larry, do you know where I will be this Saturday?" she asked. "Watching my daughter walk across the stage as she graduates from college!" she beamed. She thanked me for the opportunity to work again. I tried to push the thanks back to her, telling her that she had earned everything on her own. "No, that's not true. Thanks for the new start," she said softly. "Thanks for the new start. My daughter is going to be great!" Stories. . .about people, amazing, miraculous people. St. Luke's gospel presents a socially revolutionary Jesus. In Luke's view, Jesus comes to usher in the "Year of Jubileee" at last! Most Christians today simply aren't ready for the implications of this view of the one whom they claim to follow in life. Still, Luke comes at readers with a "turn the tables" expectation of the Messiah whom he describes. Recently, I ran across a interesting, contemporary rendition of the "Magnificant," the song of Mary that Luke places at the beginning of his story, a song that Jesus' mother sings as she considers the meaning and the work of the son she is about to deliver into the world. All the parts of my innermost being - intellect, imagination, emotions, intuition, desire, volition - unite to celebrate aloud the magnificence of the Lord. My innermost being jubilates in the God who liberates me. God has smiled upon me, God's down-to-earth servant, so I know all will be well. Countless descendants from future generations will look back, Knowing I was blessed, For Divine Power has worked powerfully on my behalf. May God's mysterious Name be ever revered. On those in every generation who hold God in reverence. And find themselves out off office and on the margins of nowhere. And the power-hungry look pathetic and weak. And the third-world finally goes first class. God sends the rich out with growling stomachs and empty plates. God's oppressed people, God's servants, finally experience God's uplifting presence. In unending fidelity to our ancestor Abraham and all his descendants. Why I get up every morning. . .
One of our interns from the Perkins School of Theology at SMU recently passed along this story. The talented seminarian offers the little girls who live in our housing at CityWalk at Akard a dance class. One day last week, during a break in the class, she overheard a 10-year-old girl tell another girl, "This Christmas will be much better than last year when we were in the shelter." 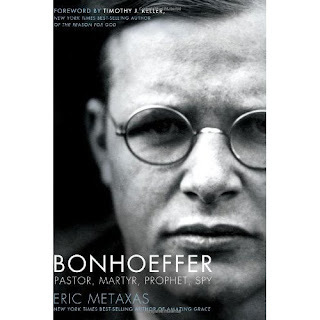 The limits of "private virture"
German pastor, theologian, and co-conspirator in efforts to eliminate Hitler,Dietrich Bonhoeffer spoke of "religionless Christianity." He offers important insights that we should consider on those who, in the face of grave evil in the world or society, retreat to "private virtuousness." Such people neither steal, nor murder, nor commit adultery, but do good according to their abilities. But. . .they must close their eyes and ears to the injustice around them. Only at the cost of self-deception can they keep their private blamelessness clean from the stains of responsible action in the world. In all that they do, what they fail to do will not let them rest. They will either be destroyed by this unrest, or they will become the most hypocritical of all Pharisees (page 470). Charity Navigator, the nation's largest, independent non-profit evaluator, recently sent us our annual rating letter. Charity Navigator "works to advance a more efficient and responsive philanthropic marketplace by evaluating the financial health of over 5,500 of America's largest charities." Naturally, all of us here at CitySquare are encouraged by Charity Navigator's opinion of our work and our management. On behalf of Charity Navigator, I wish to congratulate CitySquare on achieving our coveted 4-star rating for sound fiscal management. As the nonprofit sector continues to grow at an unprecedented pace, savvy donors are demanding more accountability, transparency and quantifiable results form the charities they choose to support with their hard-earned dollars. In this competitive philanthropic marketplace, Charity Navigator, America's premier charity evaluator, highlights the fine work of efficient charities such as your own, and provides donors with essential information needed to give them greater confidence in the charitable choices they make. Based on the most recent financial information available, we have calculated a new rating for your organization. We are proud to announce CitySquare has earned our fifth consecutive 4-star rating for its ability to efficiently manage and grow its finances. Only 6% of the charities we rate have received at least 5 consecutive 4-star evaluations, indicating that CitySquare consistently executes its mission in a fiscally responsible way, and outperforms most other charities in America. This "exceptional" designation from Charity Navigator differentiates CitySquare from its peers and demonstrates to the public it is worthy of their trust. Forbes, Business Week and Kiplingner's Financial Magazine, among others, have profiled and celebrated our unique method of applying data-driven analysis to the charitable sector. We evaluate ten times more charities that our nearest competitor and currently attract more visitors to our website than all other charity rating groups combined, thus making us the leading charity evaluator in America. Our irrefutable data show that users of our site gave more than they planned to before viewing our findings, and in fact, it is estimated that last year Charity Navigator influenced over $10 billion in charitable gifts. We believe our service will enhance your organization's fundraising and public relations efforts. Our favorable review of CitySquare's fiscal health will be visible on our website as of December 1st. I wonder how many who sing at the end do so because they are caught up in the power of this unexpected moment? How many are drawn in by the music and the shared, surprising experience? Is there a lesson here for community builders? Rules and power. . .
Hey, you gotta love this. . . Check out "Think" on KERA 90.1 FM from yesterday, Wednesday, December 8 right here. Once inside the site go to "North Texas in Need" to listen to a podcast of Krys Boyd's very beneficial program. I was honored to be on the program during the first hour to discuss CitySquare and the challenges associated with poverty. Thanks to KERA for the opportunity to be on the program. The old tree. . . The image captures something of the old Bois D'Arc tree standing next to the driveway in the house in Richardson, Texas where I grew up. So many memories remain etched in my mind about that house and this old tree. Of course, the tree remains in place beside the drive as I remember it. The tree is permanent. It's stood there for a very long time. It is much, much older than I. When I was a child, it filled the position of one of the constants of my life. I climbed in it. Shot BB guns at it. Hid behind it. Studied it. Spied on my best buddy from a perch up in its substantial limbs. This tree serves as a reminder that my life is very short and other realities matter as much or more than my concerns. I love that old tree. Every time I pass my home place, I look at this tree. D. R. E. A. M. Act click here. This reform legislation will benefit all of us, including thousands of young people here in Dallas with whom we work. ". . .I was a stranger and you welcomed me. . ." Jesus (Matthew 25). A great year. . .
Rev. Gerald Britt, VP of Public Policy and Community Program Development at CitySquare, posted the following message on his blog last Friday. It is such a good summary of the past year. I wanted readers here to see it. Note: I've edited it a bit to provide a couple of additional details. I ran into an acquaintance earlier today who asked, 'So, where have you been hiding?!' I wanted to scream out, "You have got to be kidding?!" But I also know that there are scores of people who don't know about the work we do here at CitySquare, so for them it may seem that we fly under the radar. We started off the year with the move of our administrative offices, public interest law firm, HR, finance, IT and Community Development Department into 511 N. Akard or CityWalk. As soon as we moved in, we realized not only did we bring work with us, new work was waiting for us! Along with everyone getting set up, there was a flurry of tours taking place while renovation was continuing, apartments to be leased - solidifying our relationship and roles with the management company, security issues and parking issues. We worried that neighbors who needed CitySquare LAW Center counsel would have a difficult time finding us at our new location. Boy, were we ever WRONG. The total cases closed by end of October (198) nearly equaled the total number of cases closed for all of 2009! Our food pantry has served more than 47,000 people nearly 2 million pounds of food, as of the third quarter. The summer food program served 701,000 meals to over 16,000 children in collaboration with PepsiCo, our AmeriiCorps team and the Texas Department of Agriculture. Our new, innovative program called Food on the Move enabled us to serve almost twice as many meals and children as in past summer seasons.These numbers don't include the thousands of children served in our after school meal delivery program. Our Permanent Supportive Housing Program, "Destination Home" has now moved more than 100 homeless citizens off of the street and into their own apartments. The program will expand in 2011. WorkPaths, our job training program, has graduated more than 75 people from soft skills and hard skills living wage employment training. More than 70% of the program participants moved on to living wage employment. Our Education Outreach at Roseland Homes expanded its reach to provide technology based enrichment to not only traditional age after school students, but now includes programming for mid-teens and youth preparing for college. And this year, in formalizing our public policy work, we've made our monthly Urban Engagement Book Club a tool for advocacy and public awareness. We've sponsored two documentary screenings, focused on public education and immigration (Waiting for Superman and 9500 Liberty, respectively). We've also had public awareness education initiatives, both within the organization and the community around for profit schools. We've led voter education, voter registration and GOTV efforts in our community of focus, Roseland Homes...including getting gubernatorial candidate Bill White to come visit with the residents there. We invited Governor Perry as well, but his schedule would not allow him to visit us. All of this, while at the same time, we continued preparations for our Opportunity Center, which will house our employment, health care, food programs and economic development initiatives. Add in the fact that we moved successfully through a professional rebranding process for our organization. We've done more and program directors around here might be upset because I'm not including some other great things that have happened across this organization. But believe me, I've only scratched the surface! What does all this mean (aside from the fact that there are some tired soldiers at CitySquare)? It means that CitySquare is a great investment for those who believe that as community, we can actually do something about poverty and injustice. It means that money invested in CitySquare changes the trajectory of the lives of people and gives hope to those who simply need the resources and the relationships that will make their lives better. It means it’s been a great year! Serving the times. . .
Help CitySquare (formerly Central Dallas Ministries) fight hunger and its devastating results in the lives of children and adults. Make a generous year-end gift today at www.CitySq.org. Teens who live in households where food is scarce suffer academically, but a new study has found that government programs to provide meals in schools can reverse this effect. According to the researchers, the findings suggest that school programs aimed at reducing so-called food insecurity can break an insidious cycle of poverty: poor children go hungry, get bad grades, don't go on to college and fail to rise out of their socioeconomic status -- raising children whose lives follow the same unfortunate narrative. "Food insecurity is more problematic in the long term if it occurs prior to adolescence, but it doesn't mean that adolescents are more resilient than younger children," said study leader Christelle Roustit, of the Research Group on the Social Determinants of Health and Healthcare, in Paris, France. The researchers reported their findings in the medical journal Pediatrics. The severe recession has taken a toll on food security. In the United States, a recent report by the Department of Agriculture found that nearly 15% of American households faced food insecurity at some point in 2009, the highest level since officials began tracking the measure in 1995. Food insecurity in childhood is thought to undercut scholastic achievement in at least two ways. It deprives the body of nutrients necessary for proper mental and physical development, and it creates an atmosphere of stress and uncertainty that saps a kid's desire to attend school and to perform well. In the new study, Roustit and her colleagues analyzed questionnaires given to 2,346 public high school students in Quebec, Canada, along with nearly 2,000 of their parents. The surveys asked about issues of school performance and socioeconomic status and included several questions addressing food security at home. These included whether a lack of money prevented the family from eating enough, or from buying a sufficient variety of foods. Just over 11 percent of teens in the study experienced food insecurity at home, according to the researchers. Of those, two-thirds attended schools that offered free or low-cost breakfast, lunch or snacks, allowing the researchers to look for an effect of the meals program on academic performance. The study revealed that food insecurity was strongly associated with problems in school. However, children with food insecurity at home performed significantly better academically if their school offered meal assistance. They were much less likely to be held back a year, to score badly in language testing or to rate their overall academic performance as poor. Although the data come from the 1990s, Roustit said a new survey of Quebec adolescents is now in progress. "We would be able to compare the results of 1999 to 2009 in few years," she said. Nicola Edwards, a dietician and food policy expert at California Food Policy Advocates, an Oakland-based nonprofit, said the results of the study are unsurprising. If children are hungry they cannot learn, Edwards said. "There is a direct correlation between food insecurity and academic performance," she said. In the United States, teachers and school administrators report that children who take advantage of food assistance programs in schools have improved behavior, fewer absences and better test scores, Edwards added. Under the federal Child Nutrition Act, more than 31 million American school children receive free or inexpensive lunches through the National School Lunch Program. Children from families with incomes at or below 130 percent of the poverty level ($28,665 for a family of four) are eligible for free meals. Those with incomes between 130 percent and 185 percent of the poverty level ($40,793 for a family of four) are eligible to receive lunch for a cost of no more than 40 cents. According to the U.S. Department of Agriculture, the National School Lunch Program cost $9.8 billion in 2009. A study of this program that was published earlier this year supports the Canadian findings. Dr. Peter Hinrichs at Georgetown University in Washington DC reported in the Journal of Policy Analysis and Management that for children who participate in the National School Lunch Program, "the effects on educational attainment are sizable." Type-2 diabetes continues to ravage low-income, inner city communities. Many factors contribute to the escalating health challenge, including diet, obesity and the lack of safe places for exercise. Now comes a study indicating that diabetes and depression may be feeding each other. As I read the report below from the "Health Day" section of Bloomberg News, I recalled a conversation I had with an elderly woman from South Dallas years ago. "Brother Larry," she said, "around here we carry our grief in buckets." Her way of describing the many sources and forces behind her own depression. The work we do creating hope and friendship as a vital part of our daily response to diabetes is right on target. MONDAY, Nov. 22 (HealthDay News) -- Diabetes and depression are conditions that can fuel each other, a new study shows. The research, conducted at Harvard University, found that study subjects who were depressed had a much higher risk of developing diabetes, and those with diabetes had a significantly higher risk of depression, compared to healthy study participants. "This study indicates that these two conditions can influence each other and thus become a vicious cycle," said study co-author Dr. Frank Hu, a professor of nutrition and epidemiology at the Harvard School of Public Health in Boston. "Thus, primary prevention of diabetes is important for prevention of depression, and vice versa." Love the new Downtown? Live Downtown! Want to live in booming, exciting, increasingly active Downtown Dallas? But, afraid you can't afford it? Living on wages under $30,000 annually? Feel like you're limited to the 'burbs? Drop what you are doing and call 214.303-2119. Talk to Keith. He can tell you how to get in on a great move-in deal at CityWalk! We all fall down. . . This has to be in the running for "ad of the year," if there is such an award! Everyone understands the beauty of and the need for recovery and redemption after failure.